Graphic Processing Unit (GPU) Market size was around 44,000 thousand units with an industry value of over USD 12 billion in 2017 and is set to grow at a CAGR of 30% to 2024. 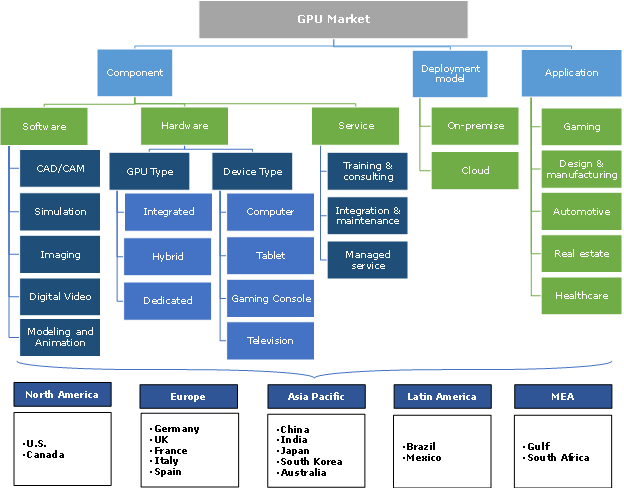 The GPU market is expected to witness an accelerated growth from 2018 to 2024 due to an increase in the adoption of GPUs for high-performance computing applications in sectors including real-estate, healthcare, automotive, and design & manufacturing. The healthcare sector is expected to witness an increase in the uptake of GPU solutions due to the growing need for real-time analytics for improving decision-making process. GPUs are widely used in medical imaging to accelerate data processing and the image rendering process. With the adoption of AI in healthcare, the demand for GPUs to trigger complex mathematical operations based on deep learning algorithms will increase. Another factor driving market growth is the increasing penetration of smartphones, tablets, and consoles for gaming purpose. As gaming applications are graphics-intensive, they need advanced graphic processors to solve complex matrix calculations and 3D image rendering. This will fuel the demand for GPUs to obtain high graphic rendering performance and to deliver an alluring experience to users. The rising popularity of Virtual Reality (VR) in gaming will also drive the need for next-generation graphic processors to support computing-intensive VR applications. The hardware segment held a majority GPU market share of over 70% in 2017 and is expected to dominate the market by 2024. The market growth is attributed to an increase in the adoption of hardware components such as integrated and dedicated processors. These processors are used in several devices including tablets, gaming consoles, and smartphones to support graphic-intensive applications. GPU shipments are estimated to register a growth rate of around 5% over the forecast timeline. In 2017, the dedicated GPU unit shipments were estimated at over 92,000 thousand units. As per the device type, tablets will witness the fastest growth rate of over 30% over the forecast period due to a rise in use of these devices for gaming purposes. These devices have inbuilt GPU processors that help to deliver immersive multimedia with 2D and 3D graphics to enhance the gaming experience. The imaging software segment in the GPU market is projected to grow at a CAGR of around 35% between 2018 to 2024. Image processing algorithms make use of GPU-accelerated computers to enhance the image rendering process. Graphics cards are extensively used for 2D & 3D image rendering in application areas including design & manufacturing, automotive, and healthcare. With large on-board graphics memory and high computational power, these systems act as an engine for imaging devices and visualization solutions. 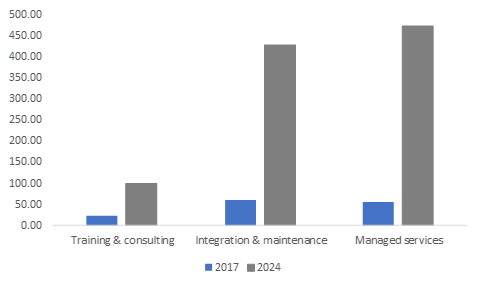 The managed services segment in the GPU market is projected to grow at a CAGR of over 35% from 2018 to 2024. Organizations are incorporating GPUs to accelerate computing capabilities of their systems. GPU-accelerated environments are becoming more complex due to the addition of various graphic processors to facilitate processing-intensive applications. This generates the demand for external expertise to manage GPU devices deployed by organizations in their premises. The cloud deployment segment is expected to grow at a CAGR of over 40% in the GPU market. The demand for cloud-based models will increase due to growing needs among organizations to manage huge datasets ensuring high-performance and reduced costs. GPU-based cloud platforms provide high reliability and ensure lower maintenance as compared to on-premise GPU deployment. An increase in the uptake of cloud models will accelerate the demand for GPUs in the cloud to deliver high performance. 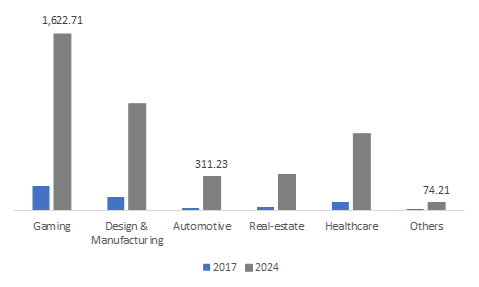 The automotive GPU market will witness the highest growth rate of over 35% from 2018 to 2024 due to an increase in the use of GPUs to accelerate design & engineering applications. As the industry is focusing on developing new vehicles with improved design & functionality, GPUs are widely used in CAD/CAM software to trigger the analysis of complex data sets and the application of queries to design new models & patterns. 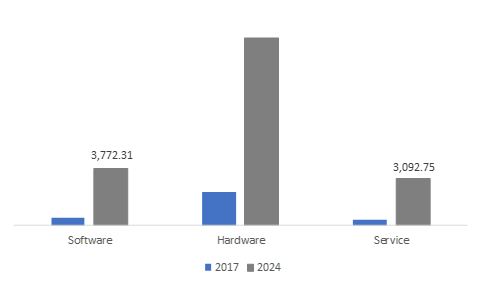 As the demand for this software will increase, the graphic processing unit (GPU) market is expected to witness a surge over the forecast timeline. 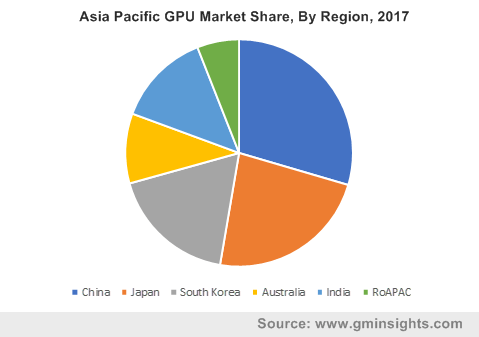 The Asia Pacific GPU market held a dominant market share of over 30% in 2017. The demand for GPUs is expected to rise in the region due to rapid growth of the gaming industry in countries including China, Japan, and India. According to the Netherlands Enterprise Agency Report, the gaming industry in Japan is the third largest in the world and generated a total revenue of around USD 12.5 billion in 2017. Emerging technologies, such as AR & VR, and the rising trend of freemium games, will foster the adoption of GPUs to deliver a better gaming experience. Moreover, an increase in use of AI for brining innovation sectors, such as healthcare and manufacturing, will also spur the demand for GPUs. AI applications involve the use of deep learning algorithms to train neural networks. Thus, to speed up the complex computational process and to find meaningful insights, systems need GPU-accelerated computers. The GPU market is dominated by the large companies, such as NVIDIA, AMD, and Intel, that hold a majority market share. The competition is quite intense as companies are rapidly developing next-generation advanced graphic chips to support computing-intensive applications. For instance, in February 2018, Lincom Electronics geared up to mass produce its graphic card chip. The chip, Lincom GP101, can be used to connect a computer through ports including DVI & VGA, and supports standards such as OpenGL ES2.0. GPU chip manufacturers are collaborating with technology companies to integrate advanced technologies into their products. For instance, in December 2017, NVIDIA collaborated with IBM to develop next-generation chips for AI and machine learning applications. Mobile manufacturing companies are also developing their own GPUs to be used in mobile devices. This enables them to gain more market share and provides them with a competitive advantage to compete with major GPU manufacturers. For instance, in June 2017, Samsung developed its own GPU for use in its mobile devices. The in-house manufacturing of GPUs enabled the company to reduce costs by eliminating the need to secure components from an outside company. The major companies operating in the graphic processing unit market include Advanced Micro Devices (AMD), Autodesk, Amazon Web Services, Cogeco Communications, Dassault Systems, Google, IBM, Intel, Microsoft, NVIDIA, Nimbix, Penguin Computing, PTC, Qualcomm, ScaleMatrix, Siemens AG, and S3 Graphics. GPUs have evolved as a response to complex applications that are graphics-intensive and cannot solely rely on built-in processors within computers. To minimize the system downtime and achieve high-performance, CPUs are used along with GPUs to facilitate complex and processing-intensive operations in engineering, data analytics, and deep learning applications. GPUs have become an essential part of high-performance computing as they use millions of small processing units to handle multiple tasks simultaneously. The rapid adoption of technologies such as AI, deep learning, and VR in various industry verticals will increase the demand for high-computing graphic processors to achieve required performance levels and to improve the efficiency of processes.